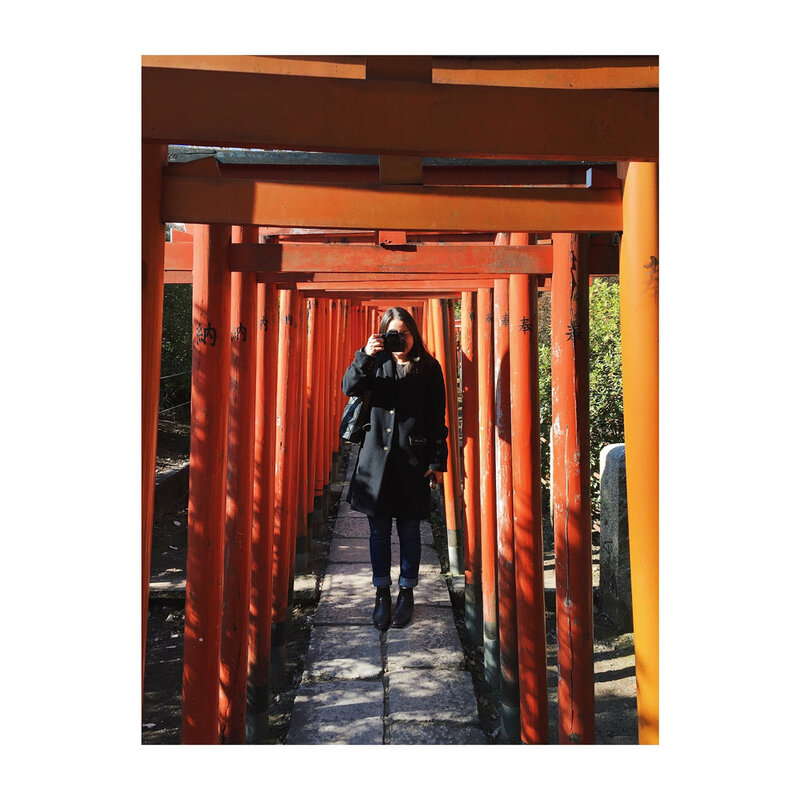 Earlier this month, my good friend Miri and I hopped on a short 2 hour flight from Tokyo --> Seoul for a weekend of spicy food, cheap cosmetics, and insta-worthy sweets! We had been planning this trip for a while now and since neither of us had ever been to South Korea before... we were stoked! We flew in on a Friday morning, stayed three nights, and flew back on Monday night. It was... dare-I-say... the absolute-most-perfect-seoul-weekend-EVER. Fun fact : the food at INCHEON airport is AMAZING. Our flight landed around noon, and we decided to grab a bite to eat before exiting the airport and it ended up being such a smart move! There is a place called Korean Food Street right when you exit customs which is basically a restaurant where you can taste all the classic Korean dishes! I loved the bean sprout pancake (bindaetteok) that was HUGE and was served with the most delicious pickled onions! YUMMMM. After that, we took an awesome bus ($15) that dropped us off right in the heart of SEOUL. The bus system from Incehon to the city is incredible!! I was so impressed by the ease of buying tickets, the location of the bus stops, and the comfort of the buses themselves! The ride into the city is over an hour so starting well was the BEST. We dropped our bags off at our place in MYEONGDONG and decided to go check out some shops. 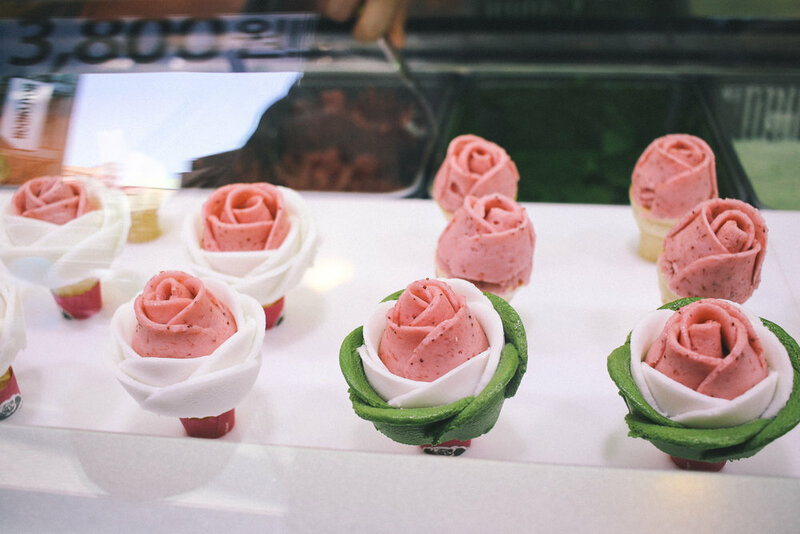 We stopped dead in our tracks when we saw this beautiful icecream. Ok first cosmetics stop...STYLENANDA. They actually have this shop in Tokyo, but I knew I had to check out the main shop in MYEONGDONG. Get ready for the most dreamy make-up store ever! OKAY...THIS LINE OF MAKE-UP (blush) WAS JUST TOO CUTE TO BE TRUE. OMMGGGAAHHHHHH. The building was 6 or 7 floors...make-up, fashion, and a cafe. UGHHHH they KNOW WHAT WE WANT!!! haha. This floor of accessories and under garments was called "LAUNDRY" ...CUTEST THING EVER. The top floor was a denim shop with a cafe...all POOL themed because WHY NOT!?? 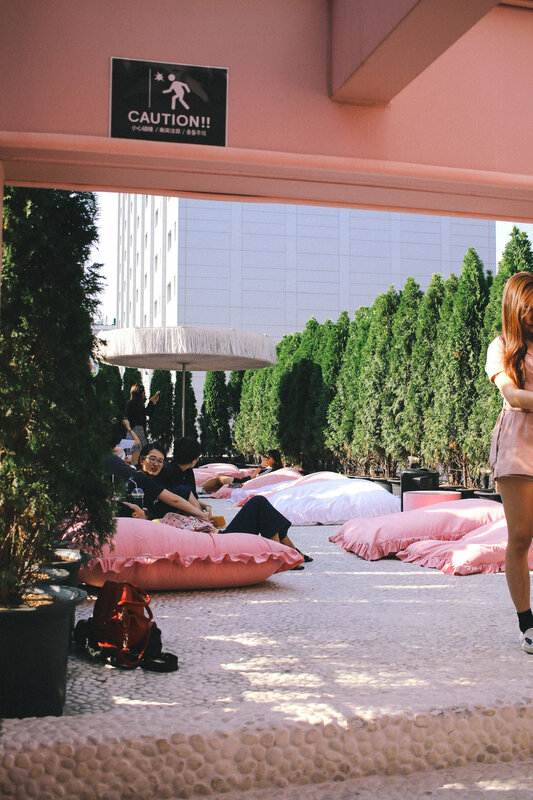 And...a cosmetic store wouldn't be complete without a rooftop chill nap spot with pink and white fluffy pillows - right!?? INSTAWORTHY. A bunch of street vendors selling LEGIT knock-offs...like all these supreme bags and shirts. You'd never see this kind of thing on the streets in Tokyo. After spending some cash on cosmetics, we met up with Miri's high school friend, Jeong, for dinner! Jeong is a local so she knew the best places to take us to. She took us to dinner at this incredible samgyeopsal (pork belly) place that was HANDS DOWN THE BEST SAMGYEOPSAL I HAVE EVER EATEN IN MY LIFEEEEEEE. Nothing can compare to this. This was just I N S A N E. The best part was actually these long garlic leaves that were soaked in vinegar that you used to wrap around the pork like a little slaty, tangy, delicious burrito and OHHHH MAN. I could not stop eating it!!!! Top it off with cold beer and some spicy Tofu soup and my first night in Seoul was already the best of the best. After dinner we walked to a nearby castle to experience some Korean culture and see ladies dressed in Hanbok, traditional Korean dresses. They are so ornate and beautiful!! BTW...something I noticed right away in Korea was how much PDA people are ok with! This might have had a greater impact on me considering I live in Japan where people are super ANTI-PDA...like you can hardly tell if people are siblings? friends? enemies? strangers? hahaa jk it's not that bad...but basically I never see anyone show any form of PDA here so it was more shocking to see couples hold hands, hug, and be all lovey dovey in public! 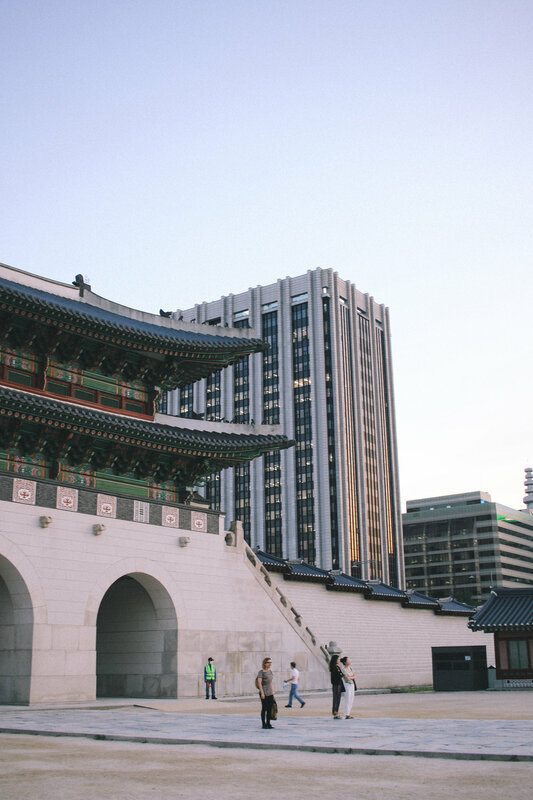 This is (ready for it...) GYEONGBOKGUNG, is the largest of the five grand palaces in Korea and a super popular spot of people to visit. I love how detailed and colorful the painting is on these buildings! They had special lights up around the castle that made it a pretty cool spot to check out even at 8pm at night. Our last stop for the night was the famous CHEONGGYEONCHEON (say that 5x fast) which is notorious for being a date spot in the city. What made me laugh was when I asked Jeong, "so, have you come here on a date before?" and she answered, "yeah, i've been here with about 5 ex-boyfriends" HAHAHAHA love it. DAY ONE IS SEOUL...AND I WAS ALREADY IN LOVE!!! !